Prep all the ingredients, soak the dry ingredients and slice when they are rehydrated. The glass noodles should also be cut shorter to about 2 inches long. 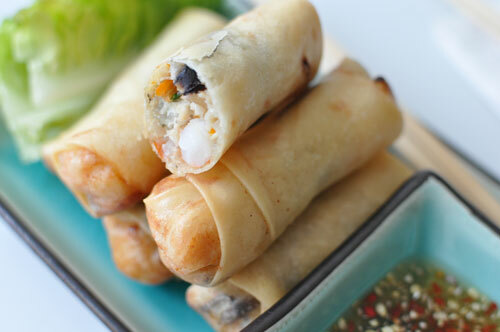 Make sure all the ingredients are dry so that it does not cause the spring roll pastry to go soggy. Mix together well and season with salt, pepper and sugar.Test a small portion. When you are perfectly happy with the flavour, make the rolls by adding a tablespoon of the mixture onto the wrapper, fold the corners to make an envelop and roll as tightly as possible, sealing the lid with some oil. Deep fry for about 4 mins at 140° or until golden brown. Serve with lettuce and herbs – roll the lettuce around the spring roll and dip into fish sauce dressing. Can also be served with a cold vermicelli salad.